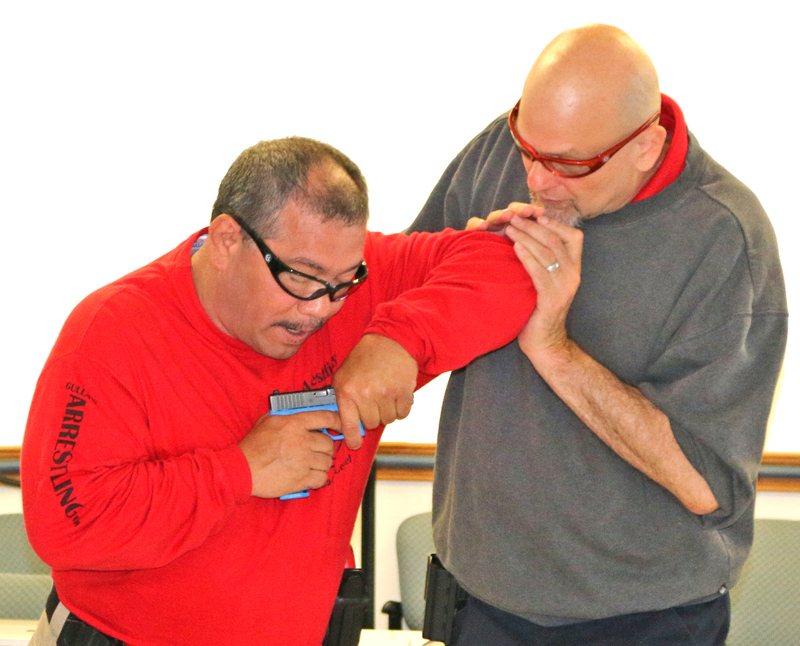 This course is designed for SWAT Teams, Tactical Units or Drug Units who have limited mobility, in low light conditions, armed with Full Auto Weapons possibly in confined spaces. These teams are responsible for taking one or multiple subjects into custody or controlled position. Generally in a high liability environment using justified force. These Teams are likely to be held to a higher standard, because of their Training, Tactics and Weapons. 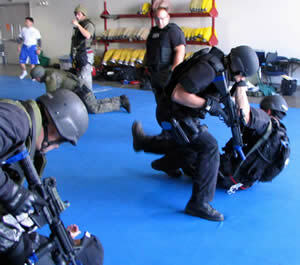 Course begins in light gear in a gym environment and works up to Reality Based Full Gear Scenario Training. 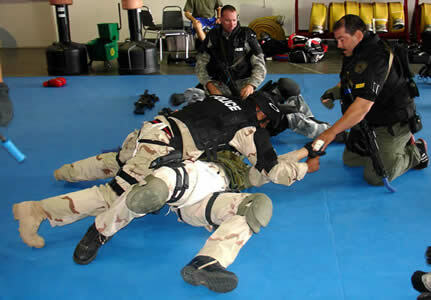 To provide training for tactical officers who wear Tactical Vest or Raid Team type gear. After this course they will be able to maintain weapon awareness, control subjects by using Team Tactics, Tactical Equipment and Tactical Control Options. 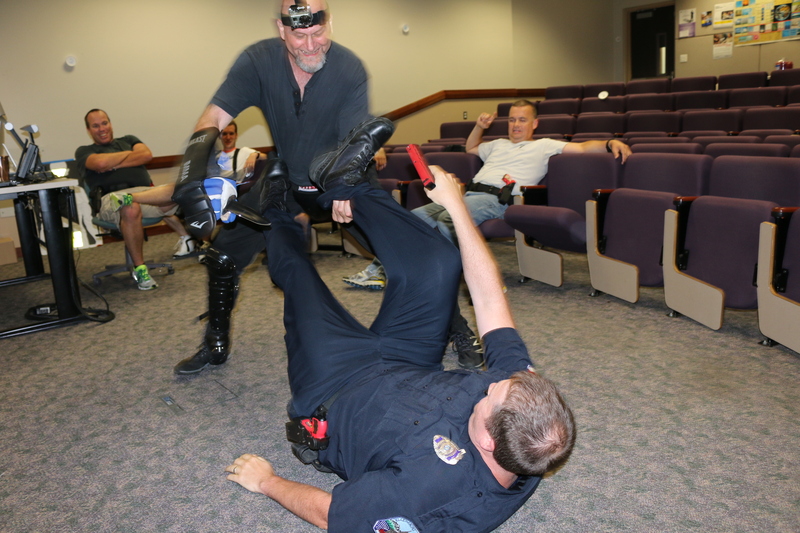 Using justified force options including Takedowns, Strikes, Ground Control and Hold and Control Tactics and Less Lethal Weapons to take them to a custody. Deputy Don Gulla is a 24 year veteran who first began his SWAT career as a member of the 1990 Goodwill Games Anti-Terrorist Response Team. He is currently assigned to a full time SWAT Team for a large Washington State Sheriff’s Dept. He is a Master DT Instructor and Arrestling Founder. He has over 38 years of Combat Arts Training. 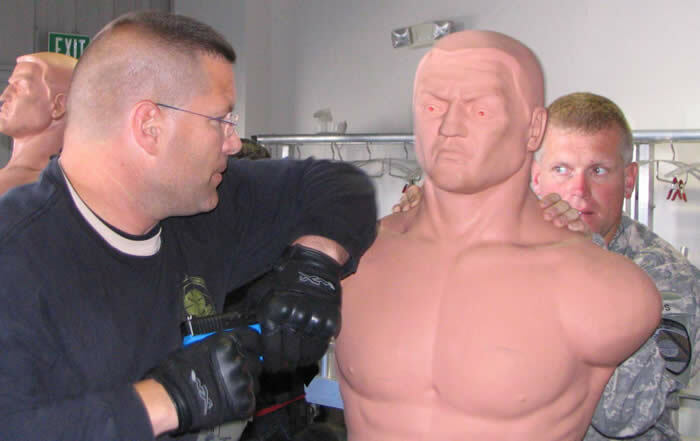 In 2007 he traveled to Russia and trained Russian OMON Team Members in Tactical Combatives. 2 days, total of 16 hours. 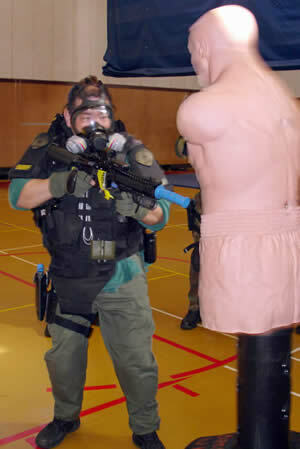 Most SWAT Team Members or Tac Team Members are no more prepared to go hands during a tactical scenario, then the average officer on patrol. In fact most are less prepared, because they have not changed their tactics to fit the gear or their environment. Even Special Forces Operators are not prepared to handle non complaint subjects in a Law Enforcement, High Liability Environment . Everyone wants to run and gun, so when a subject does not comply at gun point, the firearms dependent personality types don’t like it. For taking multiple suspects into custody with consideration to a smoke filled, low light and/or confined space. Where to carry flex-cuffs and how to quickly put them on a suspect while wearing heavy gear, gloves and having to secure you primary weapon. Maximize weapon retention, helps protect the operator and opens fields of fire for both the operator and other team members. Hallways, Walls or Vehicles can give operators an advantage to control, immobilize and take down suspects, using your heavy gear for protection, leverage and impact. How to take down suspect with one hand on suspect quickly and safely with a slung weapon. How use your equipment to strike, stun or distract a suspect. This includes how to avoid muzzle sweeping or having accidental discharges with full auto weapons, while striking or struggling to control a suspect. Weapon Control and Retention while moving past or grounding suspect’s in narrow hallways. Point of contact weapon retention with handgun and Urban Rifle using Gulla’s Weapon Retention And Positional Shooting, G-W.R.A.P.S. Let’s face it you’re wearing a bunch of gear and mobility is down the tube. Add a urban rifle and you’re very limited on tactics. We overcome this by using our added weight to our advantage. You carry them, but are you prepared to use them in a SWAT/Tactical/Warrant situation?